Keedo Pet is devoted to giving your pets the best life experience possible. We provide our customers with unique pet products and strive to go the extra mile in product quality, design, and comprehensive after-sales services. Additionally, our philosophy is that the customer is always right: please contact us with any and all feedback you may have about our products or services so that we can make sure you are fully satisfied with your purchase. Tired of plain stainless steel bowls? Try this exquisite ceramic bowls with Raised stand. Equip Your Home with The Most Stylish & Elegant Pet Feeder You've Ever Seen. This non-skid ceramic pet bowl offers durability, convenience and beautiful design, perfect for your lovely pet. Also, Designed for better eating, the bowls on the wood rack are ergonomically slanted so your pets do not have to crane his/her neck to get to the food or water. Keep gentle or healthy all the time. NON-TOXIC and HARMLESS - No smell, bacteria safe, no harmful chemicals will leach into your pet food. OK to microwave. Cleanup is easy with two separate and removable dishwasher-safe ceramic bowls. Dimensions :4.5" diameter x 2.3" height. Elevated food bowls: Whisker Relief -Pets can reach their food and water without having to bend down too far. 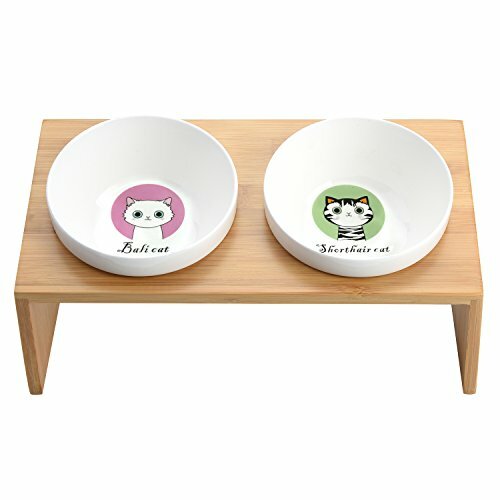 Attractive design: Delight your hungry feline friend with a dish decorated with a carton kitty. Durable and easy to clean: The two removable bowls are made of high-grade porcelain ceramic, which is conveniently dishwasher safe and easy to clean, as well as microwave safe. Non-toxic and harmless: The bowls and rack are odor free, and made without harmful chemicals. Rest easy knowing nothing toxic will leach into your pet's food. Dimensions: rack dimensions - 11"L x 5.5"W x 3.5"H (front)/4.5" H(rear); Bowl dimensions - 4.5" diameter x 2.3" height. This product may not be suitable for large dogs. View More In Raised Bowls. If you have any questions about this product by Keedo Pet, contact us by completing and submitting the form below. If you are looking for a specif part number, please include it with your message.